Can Occupational Therapy Assistants Have Tattoos? When it comes to the frequently asked question, Can Occupational Therapy Assistants Have Tattoos? You will get many different answers and pieces of advice. Of course, Occupational Therapy Assistants can have tattoos. But some employers will require them to be covered. The real question is, how will having a tattoo impact your career as an OTA? Today we will share advice from some experts to help you really answer the question. Hopefully, this info will help you have a successful career without any negative impacts from having tattoos. Some employers will require you to cover visible tattoos during your shifts while others will not. One OT professional has the following experience to share regarding their tattoos and interviewing for OT positions. I was nervous because I forgot to wear shoes that covered my foot tattoo when I interviewed for a level 2 fieldwork at a children’s hospital…the interviewer (who became my fieldwork supervisor) had a tattoo on his hand. In my current job, several OTs have small visible tattoos on their wrists or ankles. 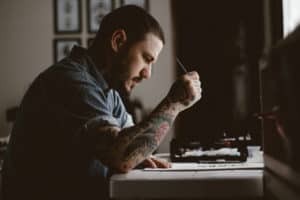 I think it depends on the individual setting, but tattoos being a deal-breaker for employment is becoming a thing of the past. We agree. In general, employers are loosening up on viewing tattoos negatively. However, that doesn’t mean there are not still many employers who take a conservative stance on tattoos and would prefer to employ folks without visible tattoos. With that being said, we definitely recommend for Occupational Therapist Assistants to cover their tattoos during interviews. In addition to considering how employers may view your tattoos, you should think about your patients. If you will be serving children or the baby boomer demographic, then it is possible that tattoos will be viewed negatively by these demographics. Tattoos sometimes scare children, and when it comes to baby boomers here is one person’s experience with tattoos. So, new OTs and OTAs, listen up! Many of your patients are likely to be people of my generation, people who are considered to be baby boomers, who share my sentiments about things like tattoos. Granted, my generation certainly was not perfect; many boomers didn’t mess up their bodies with tattoos and piercings… Imagine yourself as a patient or potential employer. How might the tattoo that you are considering cause people to view you? It really doesn’t matter what your intentions are with your tattoos, no matter how positive they may be. Some people, including management and your superiors, simply may not see your intentions. Many people have a hard stigma about tattoos, and can’t see past it. Just listen to this nurse’s experience working in healthcare since 1979. Like Eric, I would keep them covered up. I have been in the medical field since 1979 and naturally then it was shameful to see a nurse not even a male nurse with tats. I have worked 4 years ago finally in the private sector and worked with two nurses that loved their tattoos and were not ashamed to show them to anyone. With this came much retribution from the docs and management. Working in health care is a highly rewarding and challenging job. Don’t make it harder on yourself by asking for trouble from your superiors and upper management. It is far more likely that having visible tattoos as an OTA will make your career more difficult, than making it easier. Questions About Occupational Therapist Assistants (COTA)?